At Nyle Maxwell CDJR of Taylor, we offer a wide selection of new Chrysler, Dodge, Jeep, and RAM vehicles for sale in Taylor, along with used cars, trucks, and SUVs by top manufacturers. Our helpful sales staff is ready to help you find that new or used car you have been searching for in Georgetown or College Station. For years, our financial staff at Nyle Maxwell CDJR of Taylor has offered expert advice for those seeking a great Chrysler, Dodge, Jeep, or RAM car loan or lease. Now offering a special finance department to investigate options for all credit and financial situations, we strive to get the customer the car they desire with the financing they deserve. Our friendly staff will assist you from beginning to end to make sure your car buying experience is like no other, but our service doesn’t stop there. 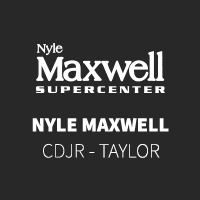 Nyle Maxwell CDJR of Taylor customers can come in and take advantage of our knowledgeable Chrysler, Dodge, Jeep, and RAM car repair technicians and a fully-stocked inventory of Chrysler, Dodge, Jeep, and RAM car and truck parts at our service department. You can reach Nyle Maxwell CDJR of Taylor any time by filling out our contact form, by calling us at 512-686-0062, or simply visiting our Chrysler, Dodge, Jeep, and RAM dealership at 14150 US-79 in Taylor, TX. We look forward to helping you get behind the wheel of a vehicle you’ll love.